Classic Synths is a collection of over 600 MB of finely-crafted sounds sampled from legendary synths. The Oberheim Matrix and OB, Roland Juno and JX, Yamaha CS and DX series, to mention just a few, have been carefully sampled and selected for inclusion in this choice palette of timbres. Incredibly warm pads, pumping basses, aggressive leads, brilliant electric pianos, sparkling brasses are some of the variety of sounds designed to satisfy a vast range of needs…and all of it lives up to Sound Burst's first-rate standards. Classic Synths is available for both Mac and PC on separate CD-ROMs and is compatible with the BitHeadz Unity series software sampler only. 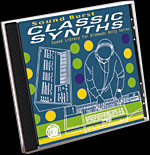 They will give you a taste of the more than 200 banks included on the Classic Synths CD-ROM.